The John Tyler Dollar was the second release of the Presidential Dollar series for 2009 and the tenth release of the series overall. The coins were officially issued for circulation on May 21, 2009, with sales of the US Mint’s numismatic rolls beginning on the same day. John Tyler was the Vice President under President William Henry Harrison. After only 30 days, Harrison died in office and Tyler assumed the Presidency. He set an important precedent by assuming all of the responsibilities and powers of the office. He served the remainder of the single term from 1841 to 1845. 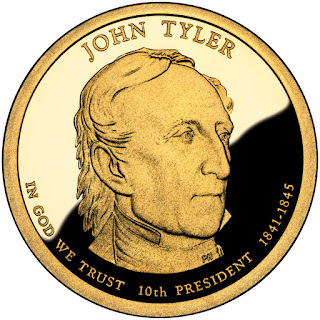 An official launch ceremony for the John Tyler Presidential Dollar was held two days before the circulation release date. The ceremony was held at Sherwood Forest Plantation in Charles City County, Virginia, hosted by Andrew Brunhart, the United States Mint Deputy Director, and Harrison Tyler, the grandson of President John Tyler. Children in attendance were given a free Presidential Dollar to commemorate the day. The reverse of the coin features the rendition of the Statue of Liberty designed and sculpted by Don Everhart. This design has been used for each year of the series since it began in 2007. The inscriptions include “United States of America” and the face value expressed as “$1″. 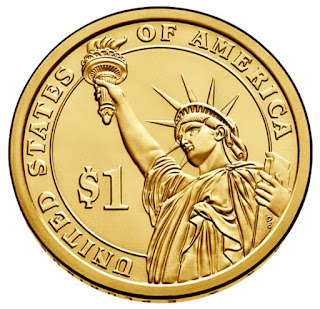 In 2009, the placement of the “In God We Trust” motto was moved to the obverse of the coin. This followed early public confusion about the government’s intentions when the motto was placed on the edge lettering of the coin. The other famous motto “E Pluribus Unum,” the date, and mint mark still appear on the edge lettering of the coin. There were a total of 87,080,000 John Tyler Presidential Dollars produced by the United States Mint. This amount was divided equally between the Philadelphia and Denver facilities. 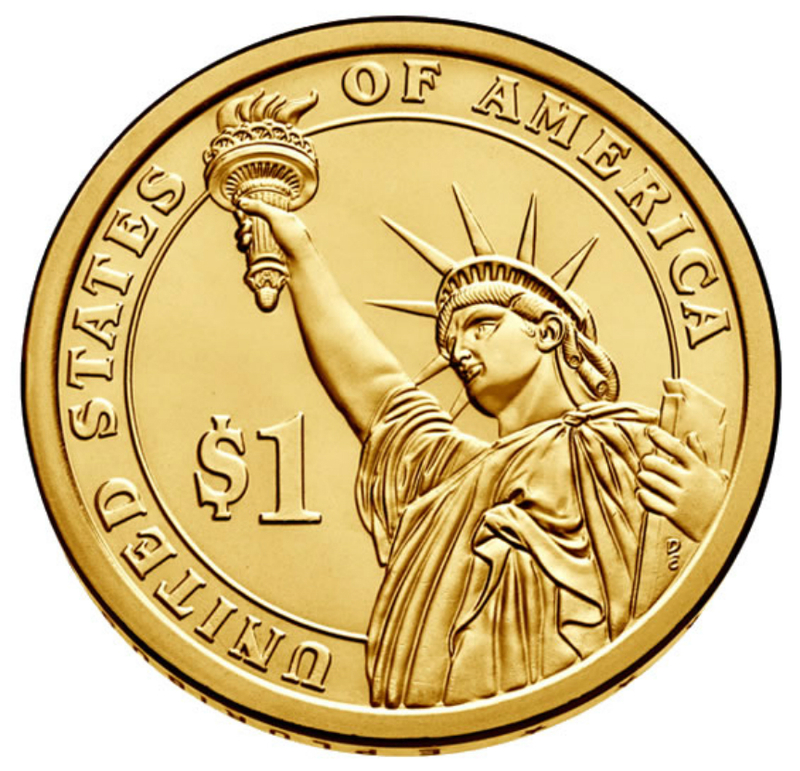 Starting with this year’s coins, the United States Mint reduced the number of numismatic products released for the series. 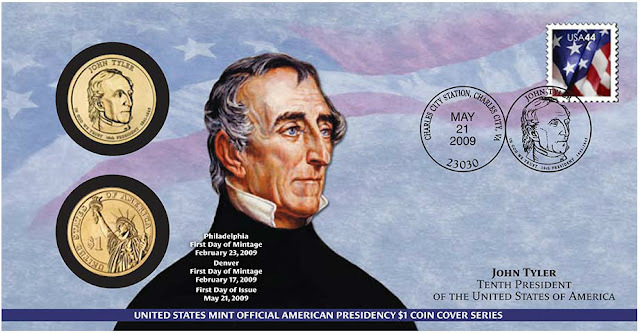 Previously available Historical Signature Sets, individual proof coins, 250-coin bags, and the annual uncirculated dollar sets were no longer offered. John Tyler (March 29, 1790 – January 18, 1862) was the tenth President of the United States (1841–45). He was elected vice president on the 1840 Whig ticket with William Henry Harrison, and became president after his running mate's death in April 1841. Tyler was known as a supporter of states' rights, which endeared him to his fellow Virginians, yet his acts as president showed that he was willing to support nationalist policies as long as they did not infringe on the rights of the states. Still, the circumstances of his unexpected rise to the presidency and his possible threat to the ambitions of other potential presidential candidates left him estranged from both major parties in Washington. A firm believer in manifest destiny, President Tyler sought to strengthen and preserve the Union through territorial expansion, most notably the annexation of the independent Republic of Texas in his last days in office. Tyler, born to an aristocratic Virginia family, came to national prominence at a time of political upheaval. In the 1820s the nation's only political party, the Democratic-Republicans, split into factions. Though initially a Democrat, his opposition to Andrew Jackson and Martin Van Buren led him to ally with the Whig Party. Tyler served as a Virginia state legislator, governor, U.S. representative, and U.S. senator before his election as vice president in the presidential election of 1840. He was put on the ticket to attract states' rights Southerners to what was then a Whig coalition to defeat Van Buren's re-election bid. Harrison's death made Tyler the first vice president to succeed to the presidency without being elected to the office. Because of the short duration of Harrison's one-month term, Tyler served longer than any president in U.S. history who was never elected to the office. To forestall constitutional uncertainty, Tyler immediately took the oath of office, moved into the White House, and assumed full presidential powers, a precedent that would govern future successions and eventually become codified in the Twenty-fifth Amendment. A strict constructionist, Tyler found much of the Whig platform unconstitutional, and vetoed several of his party's bills. Believing that the president should set policy instead of deferring to Congress, he attempted to bypass the Whig establishment, most notably Kentucky Senator Henry Clay. Most of Tyler's Cabinet resigned soon into his term, and the Whigs, dubbing him His Accidency, expelled him from the party. Though Tyler was not the first president to veto bills, he was the first to see his veto overridden by Congress. Although he faced a stalemate on domestic policy, he had several foreign-policy achievements, including the Webster–Ashburton Treaty with Britain and the Treaty of Wanghia with Qing China. President Tyler dedicated his last two years in office to the annexation of Texas. He initially sought election to a full term, but after losing the support of both Whigs and Democrats, he withdrew. In the last days of his term, Congress passed the resolution authorizing the Texas annexation, which was carried out by Tyler's successor, James K. Polk. When the American Civil War began in 1861, Tyler sided with the Confederate government, and won election to the Confederate House of Representatives shortly before his death. Although some have praised Tyler's political resolve, his presidency is generally held in low esteem by historians; today he is considered an obscure president, with little presence in the American cultural memory.